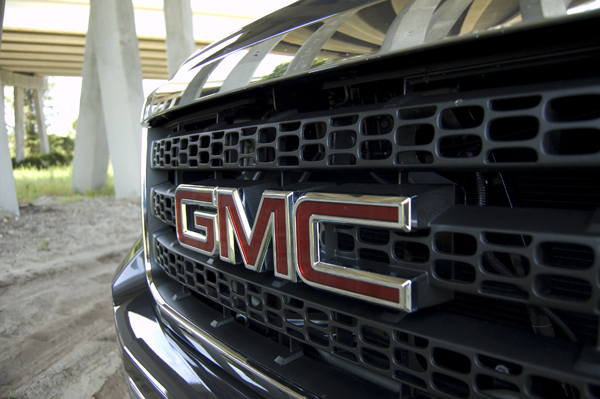 GMC is truly professional grade in the since that they build vehicles for the professional. Whether it be a CEO of a construction company or white-collar business professional. 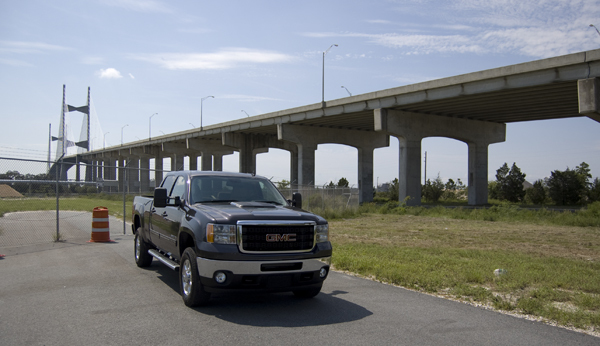 The new 2011 GMC Sierra 3500HD is a good fit for either, although it perfectly suites those who need maximum towing and hauling capabilities in a pick-up truck. 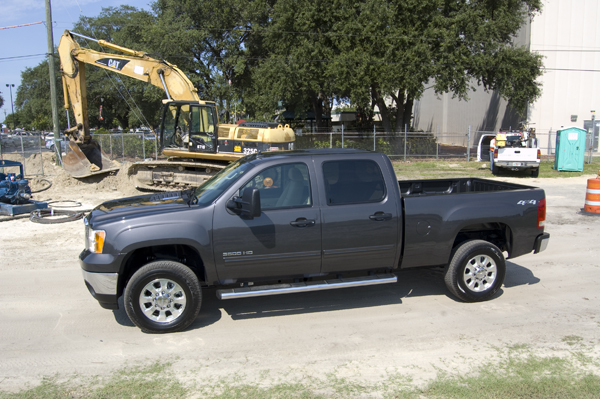 The 2011 GMC Sierra 3500HD can do it all and then some when it comes to a pick-up truck. 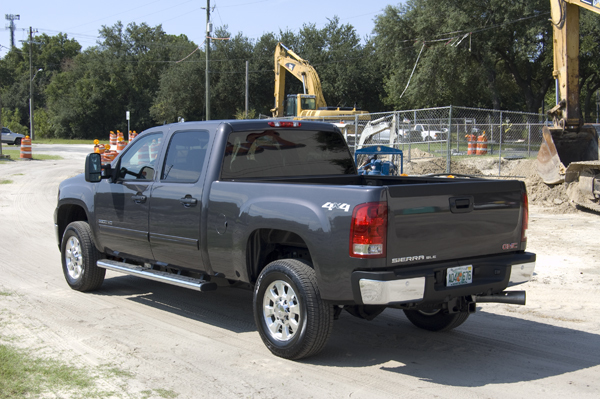 If you can only imagine a 6.6-liter V8 Duramax Diesel engine with 765 foot pounds of torque giving the Sierra 3500HD the ability to conventionally tow 17,000lbs. If that does not say a lot then I don’t know what does. 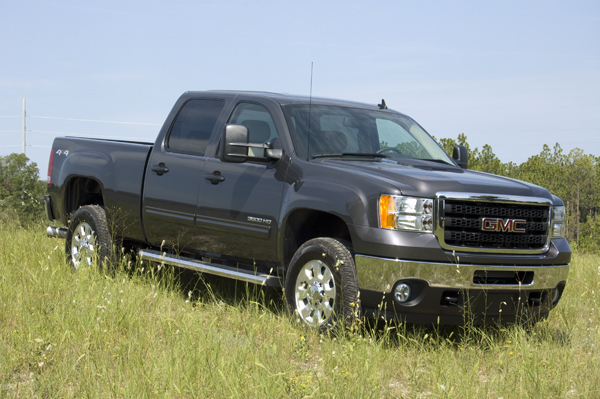 Aside from its best-in-class towing, the 2011 Sierra 3500HD has best-in-class hauling where it can haul a payload of 6,635lbs. I am not sure what exactly would tip the scale that far but if you found something (or something’s), you could haul it. For the conscious heavy duty pick-up truck shopper, the GMC Sierra gives Ford and Dodge’s heavy duty models a serious run for their money especially with the Sierra having a slight edge in towing and hauling capabilities. 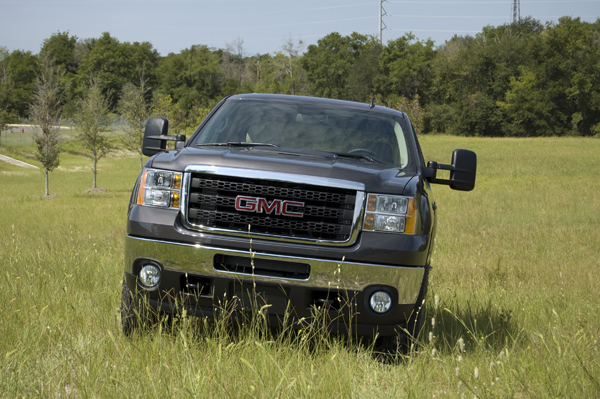 New for 2011, GMC has reshaped the front end of the Sierra slightly. Still, there is no mistake in identifying General Motor’s line of trucks including the Sierra’s Silverado sibling. 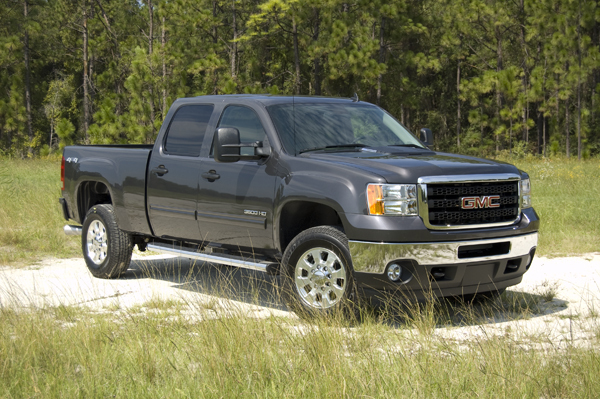 The exterior of the GMC Sierra does not sway too far from its classic heritage of pick-up trucks built for a purpose. 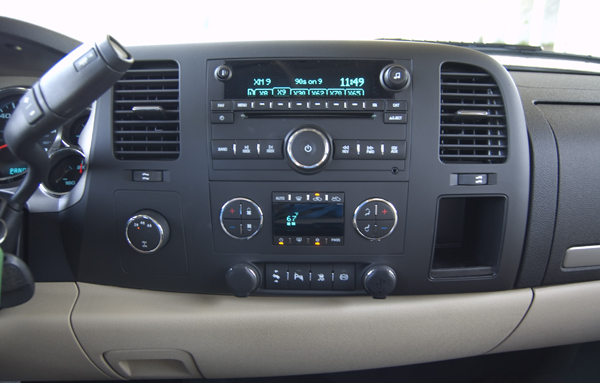 The interior of our 2011 Sierra 3500HD Crew Cab test vehicle was laced with several amenities including power driver’s seat along side of the 40/20/40 split bench, satellite radio, Bluetooth phone integration, dual zone climate controls, standard OnStar, USB port for iPod integration (also worked well with our iPhone), rearview mirror backup camera, tow gain controls and a switch for the exhaust brake (builds exhaust back-pressure in diesel engines to help slow the vehicle). The Sierra 3500 Crew Cab configured in a manner such as our test vehicle, should satisfy any potential buyer including all 6 adult passengers who can sit comfortably in the Sierra’s cabin. One of our favorite features of the Sierra was the review mirror backup camera obviously due to the Sierra 3500HD’s sheer size. 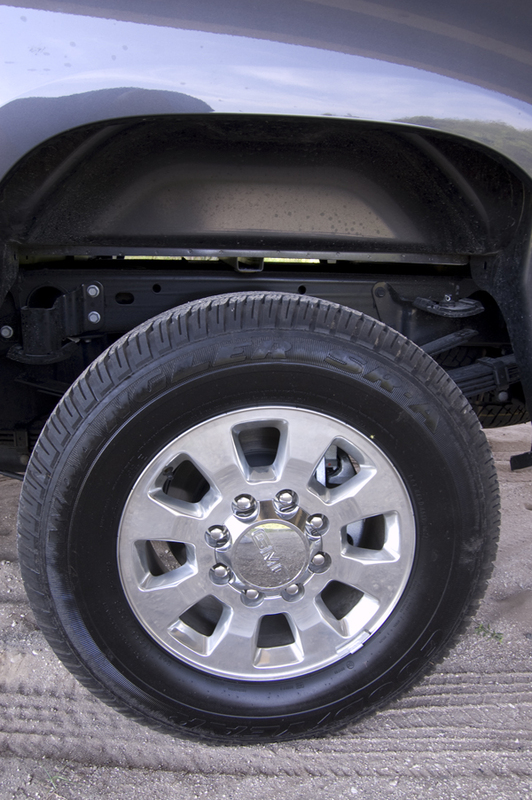 Parking this bad-boy can be a task at times and the rearview camera takes the guess work out of backing up. More trucks should have this feature available. You would think that the Sierra 3500HD gets poor gas mileage even with an empty payload, considering it is powered by a 397 horsepower and an astonishing 765ft-lbs of torque diesel V8. In comparison to other heavy duty trucks the Sierra 3500HD does a decent job mainly on the highway even when pulling a load. Test numbers from some sources will tell you that they are still able to get close to 20mpg while hauling a slight payload on the highway. The usual diesel clatter noise is noticeable but somewhat subdued when accelerating. You start to hear more of the turbo spool up than anything at times which is a good sound to hear instead of a multitude of diesel engine clatter. 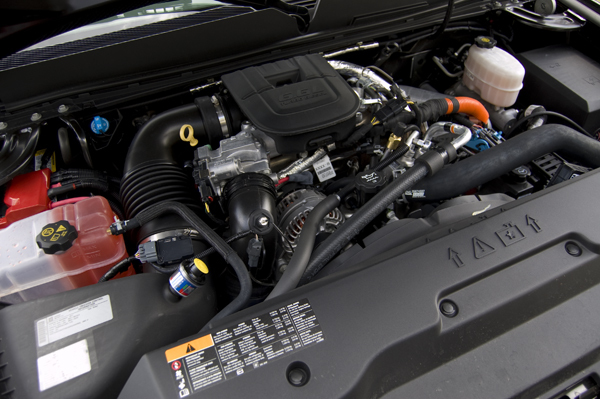 This in-part is due to the Duramax Diesel’s high-pressure common rail injection system, particulate filter and urea-injection system. The beefy Allison H.D. 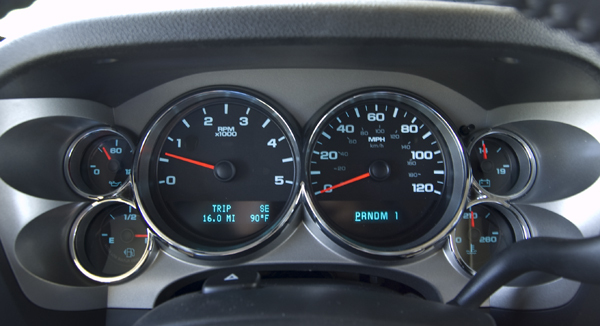 6-speed automatic transmission (same brand as in M1 Abrams Military Tank) keeps the diesel in its optimal torque range never spinning the engine up too high out of a usable power band. 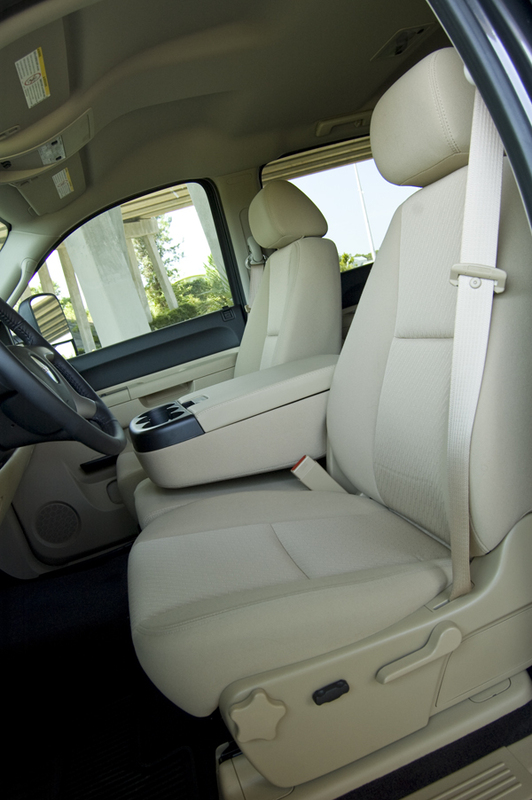 Ride quality of our GMC Sierra was somewhat better than what we have experienced in other pick-up trucks in the past. Although you are kindly reminded that you are in a ‘big truck’ going down the downtown roads of any city. Our Sierra was relatively easy to drive with the exception of parking as I mentioned earlier. Keeping the Sierra in its own space on the road is easier than I thought as I became more familiar with the vehicle. 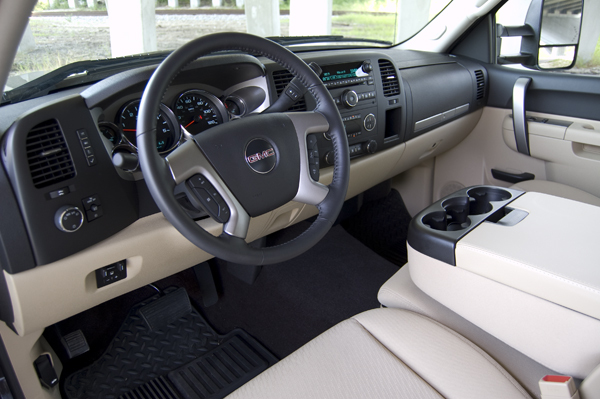 Initially climbing into the big 3500HD’s cabin and driving down the street for the first time does give you a slight U-haul truck feeling but it goes away after feeling the torque put you back in the seat during acceleration. The 4×4 system on the Sierra 3500HD is top-notch as everything else is. I actually found a time that I had to use four-wheel-drive because the light rear-end was digging itself in a soft patch of sand on my way to greener pastures here in sunny Florida. As you can imagine, the single-rear-wheel Sierra is much more manageable than the dual-wheel version in maneuvering situations. 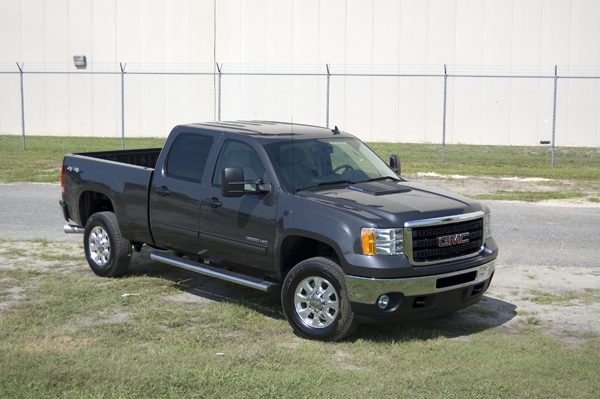 Our 2011 GMC Sierra 3500HD SLE Crew Cab (Single Rear Wheel) starts at $40,485 and optioned out like our test vehicle comes in at $53,459. 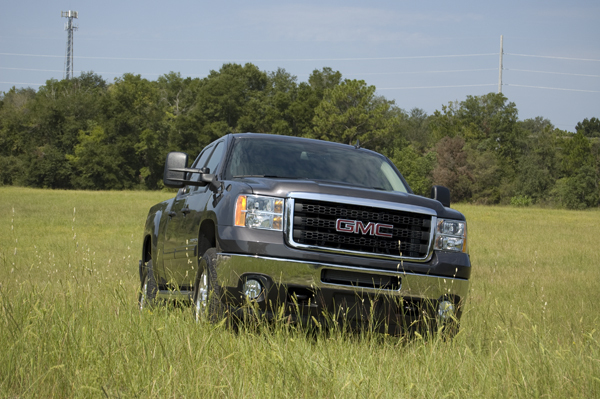 If you want a real truck that is capable of… just about anything that you think a truck can do, then the GMC Sierra 1500 or 2500 is your choice. 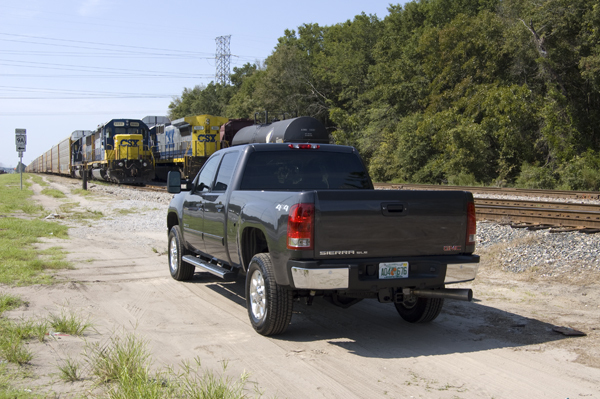 If you want to tow the neighbors house and cars at the same time, then the Sierra 3500HD with the 6.6-liter Duramax V8 is the one that will get-r-done. Front Hip Room: 60.3 in. Rear Head Room: 40.6 in. 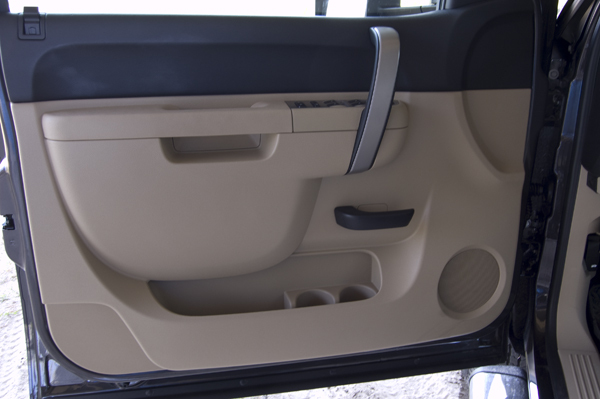 Rear Shoulder Room: 65.2 in. Rear Hip Room: 65.5 in. 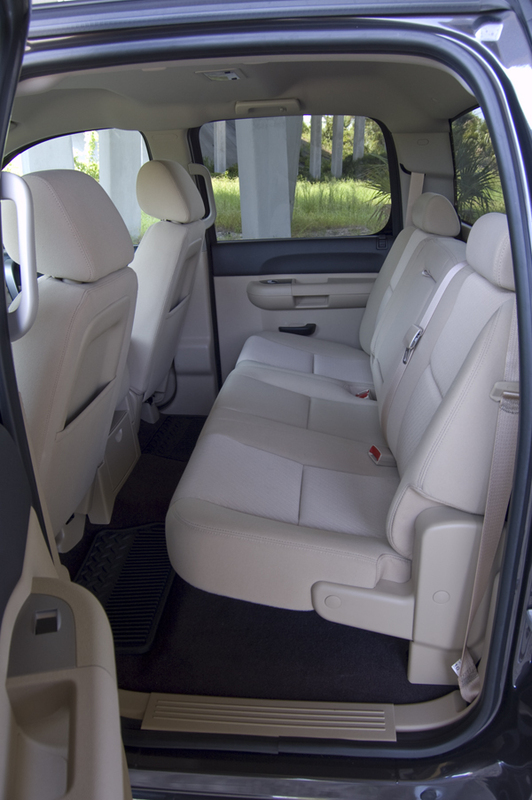 Rear Leg Room: 39 in. Maximum Towing Capacity: 17,000 lbs.